Two Ospreys chicks are out of their shells and are ready to eat, eat, and eat some more. Already hooked on Rachel and Steve's live cam? You’re not alone: Thousands have tuned in to explore.org's feed, and the fun’s just starting, with two of the three eggs hatching last week. Back in April, the Osprey couple Rachel and Steve returned for the third year in a row to their nesting spot on Hog Island, Maine. After working together with her mate to spruce up the yearly nest, Rachel laid three eggs on May 1, 4, and 7. Though they’ve been working non-stop all spring, last week was especially busy for the veteran parents. Last Sunday, the first hatchling broke free from its shell after 22 exhausting hours of pipping, by using its sharply calcified egg tooth to hack its way out. The second baby was less of a handful—hatching Thursday afternoon after just four short hours of pipping. The third and last chick is expected to emerge shortly, too, since the typical incubation time is between 32 to 42 days (see update below). These new additions to the family are extremely welcome, but they also mean that Steve’s under serious pressure to bring home the bread. A clutch of three needs about six pounds of fresh fish a day, right from day one. About 99.9 percent of the osprey diet consists of fish, an anomaly among birds of prey (the .01 percent represents the occasional snake, salamander, rodent or bird). Adults rarely drink water, and chicks are entirely reliant on fish for hydration. The first hatchling will have the upper hand on its siblings, since it got to feast solo for a few days. The chicks double their weight in the first week of life. Ospreys normally lay three to four eggs, but not all of them will hatch if there’s a shortage of food supplies. In years when fish is not plenty, only the first baby may pip. So far Steve’s been living up to his six-fish-a-day quota, delivering plenty of particularly plump menhaden, flounder, and herring. Things are looking good for a third hatch. If all goes well, this year’s three chicks will join quite a large brood. Rachel and Steve have five already-fledged offspring, the eldest of which should have established a home range near its parents this spring. Yet it will take at least another year before Rachel and Steve can claim the title of “grandparents," which is probably just as well. The sleepless nights have only just begun for the pair: They’ve got two months to go before the chicks even begin to test out their wings. 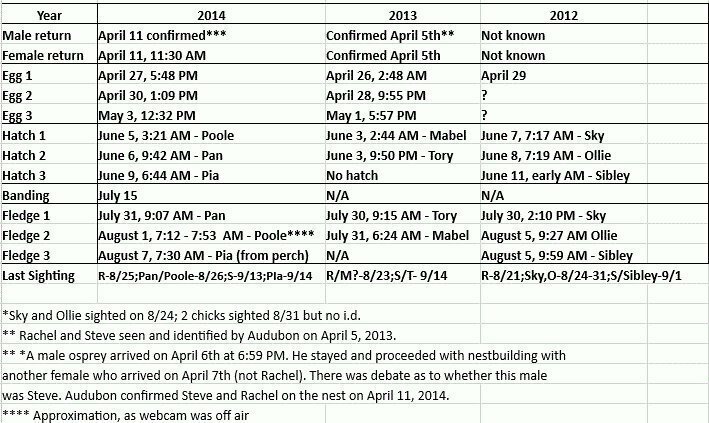 Update: Since this story was published, our super sharp viewers have determined that the egg Rachel laid on May 4 hasn't hatched yet. Since it's well past the incubation period, the egg is probably not viable. It will eventually be discarded by the adults Ospreys, or it will break down and become part of the nest's lining. Having an egg that doesn't hatch is common; the extra one is like a backup plan for the parents.